President Museveni has warned some newspapers against publicizing false information that can cause confusion in society. He said that the print media should always work for peace instead of making it a business to spread discord. “I want really to warn some of these newspapers that we are not here to build our country. As Christians, we work for peace not for discord. They should not make it a business to spread discord,” he stressed. The President issued the warning following complaints by Kampala Archbishop, the Most Rev. Dr. Cyprian Kizito Lwanga, who observed that some newspapers publish unresearched information. Mr. Museveni was speaking this at Hotel Africana in Kampala as guest of honor at the one-day conference of the Wekembe Group, a Catholic Association established by Archbishop Kizito Lwanga in 1995 to help Christians eradicate poverty from their homes. Wekembe, which in Luganda means work hard, is an acronym for women empowerment with knowledge evangelization management and basic entrepreneurial skills. The organisation whose main aim is to cause socio-economic transformation mainly among women, has supported over 12,800 clients organized in 526 community based associations in 8 districts of Butambala, Kampala, Luweero, Mpigi, Mukono, Nakaseke, Buikwe and Wakiso in the Central Region. The President noted that it was true the newspapers were doing everything possible to cause confusion in society but warned them to stop it. Mr. Museveni appreciated the work approach adopted by the church through helping wananchi to create wealth. He likened it to the government programme of Operation Wealth Creation (OWC) that tries to help everybody as opposed to the Wekembe Group that is purely on proven merit after thorough training. 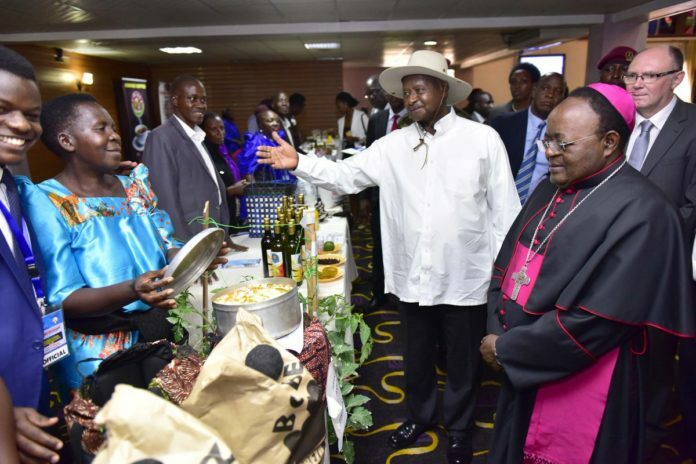 The President pledged to partner with the church to merge the government approach of OWC with that of the Wekembe Group to realize a huge impact in society. He, at this juncture, pledged to support the Association of Wekembe Group with Shs. 500 million in the next financial year 2018/2019. Regarding concern about climate change, President Museveni told the gathering that a campaign on irrigation has been started and the government will involve the church by providing irrigation equipment. “Uganda should not be a poor country at all. We have 2 rain seasons and with irrigation, we shall have more planting seasons,” he noted.